Do you remember my rant about people who buy correspondence PhDs from non-accredited colleges, and parade them as if they are bona fide qualifications? And my letter to Sainsbury’s? Although they quite clearly think I’m a nutter. Its genius. I'm going to use that phrase everytime someone complains to me about anything from now on. A small victory for you, and against the abuse of qualifications. Well done. Great stuff! I went through a phase of sending irate 'nutter' letters (mainly to MPs and other government bods) and it was always amusing to see the replies I got. Even better by email because they were less formal – and less concerned with proper grammar, punctuation and spelling. @mjp – yes, I noticed the signature too. They must have some scientific training: that's a chebyshev polynomial isn't it? 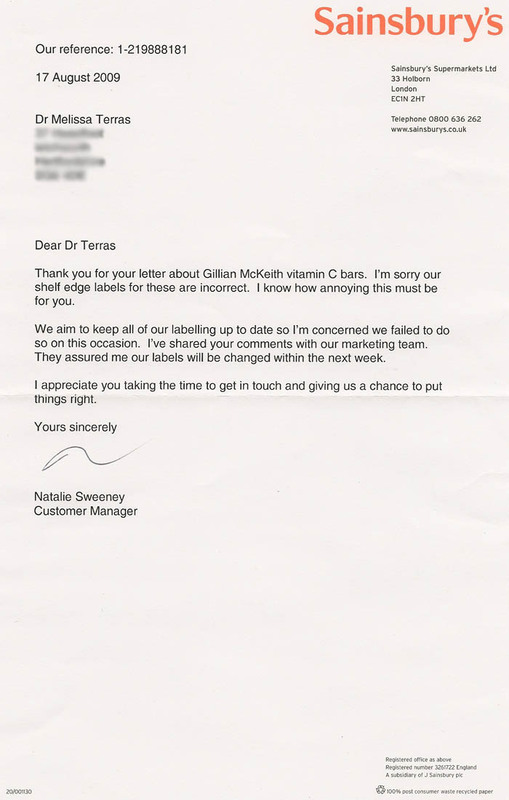 cracking result – I too love the “I know how annoying it must be for you” part of the letter! In my holiday job experience of receiving and replying to complaint letters, polite and sensible ones are so infrequent, it was actually a pleasure to reply to, and hopefully take action upon, their point.